Raspberry Jams, which have taken places in dozens of cities, feature workshops to introduce Raspberry Pi to newcomers, teach them how it works, and begin a conversation about digital making and computer programming. So what is the Raspberry Pi? 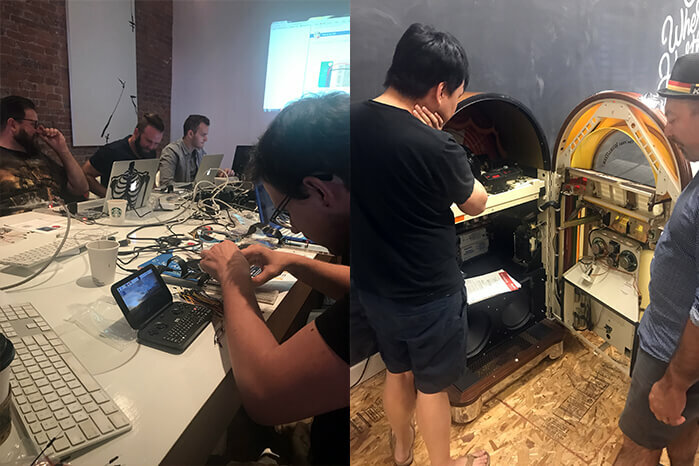 It’s “a small and affordable computer that you can use to learn programming.” Since we at Pound & Grain are passionate about creating, developing and digital making, we were very excited to host and take part in the workshop at our Vancouver office last week. Let’s hear from Sandy, our managing partner, who attended the event himself and watched the extreme geekiness in real time. What is a Raspberry Pi/Raspberry Jam? 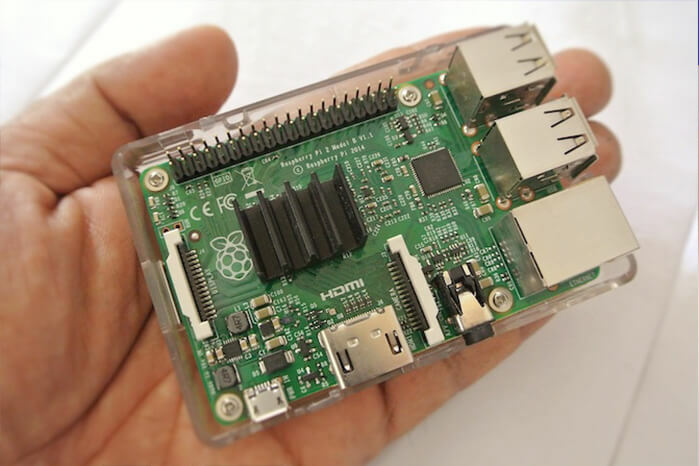 The Raspberry Pi is a small computer developed by the Raspberry Pi Foundation to promote the teaching of basic computer science in schools and in developing countries. The Raspberry Pi is a very extensible computer, and you can do lots of cool things with it that let you get under the hood and really learn about how computers work. A breadboard is a construction base for prototyping of electronics. A Raspberry Jam is a workshop providing an introduction to the Raspberry Pi. "The Raspberry Pi is a very extensible computer"
How did Raspberry Jam come to Pound & Grain, Vancouver? 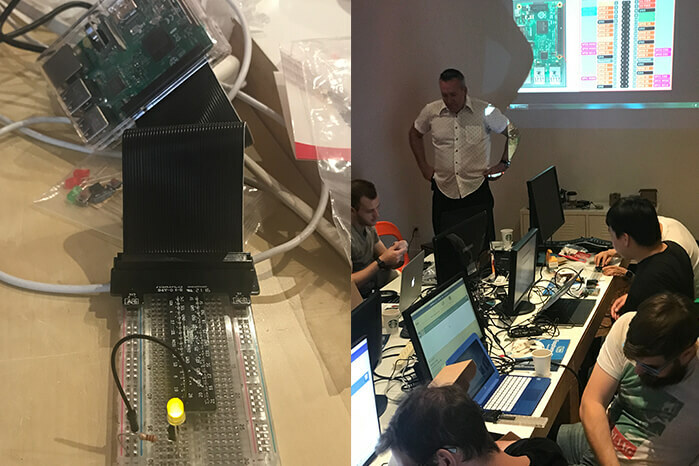 The Raspberry Jam was led by Haig Armen (Associate Professor of Design, Emily Carr University of Art + Design) and Shaun Bergmann (Director of Interaction Design and Programming, PJS Systems Inc.). Haig is an old friend, and when he told me that the IxDA were planning a Raspberry Jam, I didn’t hesitate to offer up our studio. Why were you interested in attending Raspberry Jam and what did you learn? I think it’s important to get under the hood of how computers work. And you can do lots of neat things with the Raspberry Pi. I believe in the foundation’s mission too! I’ve got an older one sitting in my desk drawer, but never quite got it set up. At the Jam, I learned how to set it up, and just how versatile and useful of a device it is. In true maker fashion, we walked through setting up our Raspberry Pi’s and proceeded to connect it to an LED light via a breadboard, and then we wrote a short Python script for a switch that could turn the light on and off. "We wrote a short Python script"
What was your favourite part about Raspberry Jam? Listening to stories about how it could be used, and all the amazing peripherals/sensors that come with it. It was interesting to listen to how Shawn (the instructor) uses a Raspberry Pi to simulate sunrise and sunset for his lizards and frogs. Lighting available in stores simple turns on and off every 8 hours. This wasn’t good enough for Shawn and his amphibians. Shawn’s Raspberry Pi queries to a NASA service over the internet that returns specific times for sunrise and sunset on a given day, based on a set of specific coordinates (longitude and latitude.) Then, the Pi activates a series of lights on dimmer switches based on this timing info that updates daily. There you have it, simulated sunrise and sunset. Where is there an overlap between digital marketing and computer programming? I think the biggest opportunity is that its inexpensive to internet-enable pretty much anything. It really fits into the whole Internet of Things. It was an honour to host Raspberry Jam at Pound & Grain. Thank you to Haig Armen and Shaun Bergmann for organizing and instructing the event. We learned a lot and really enjoyed your stories. If you are interested in getting your hands on a Raspberry Pi, or want to start your own Raspberry Jam, visit www.raspberrypi.org to learn more.